Microgreens, ready to deliver serious nutrients. It was during one of her pregnancies that Mary Finlay discovered she could not eat lettuce, not even organic lettuce. 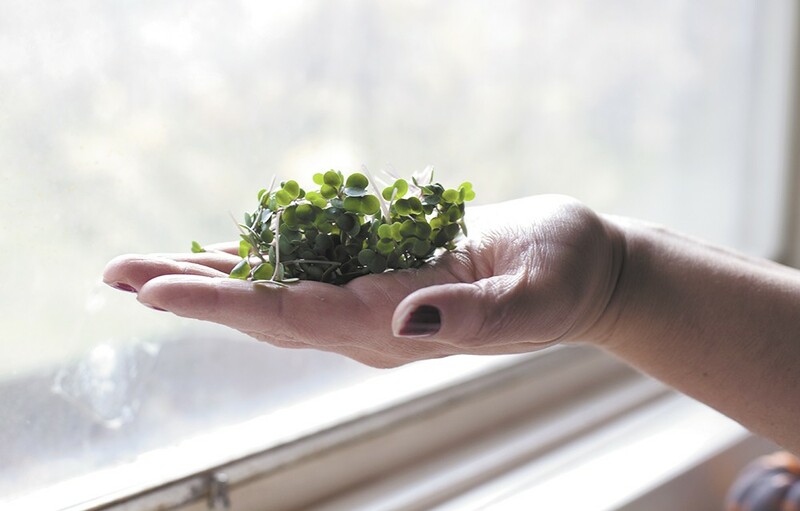 Then she tried microgreens — the term for young plant varieties like pea shoots and radishes that germinate quickly, sometimes in as little as a week. It was a match made in heaven. Not only did microgreens prove palatable to this health-conscious North Idaho mother of five, they provided a wealth of nutrients in every tiny mouthful. Researchers have found that the diminutive delicacies contain as much as 40 times the vital nutrients — vitamins like C, E and K, as well as antioxidants — as the full-grown versions of the same plant. She made salads with them, put them in smoothies and inserted the greens anywhere lettuce might normally show up. After finding supplies limited in grocery stores, the Finlays started growing their own microgreens, experimenting with different varieties and setups. Eventually they looked into expanding and monetizing their efforts. It's become a healthy little business, with the greens selling selling for $4 per ounce. 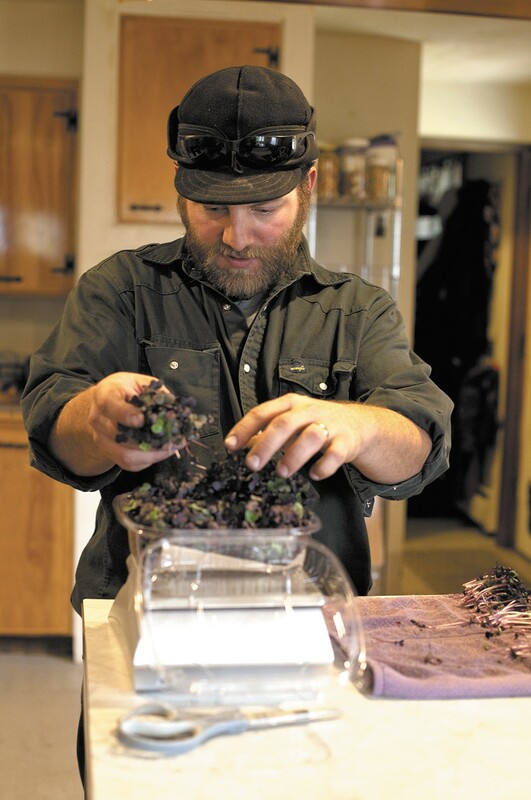 "We started with microgreens because we didn't need any land or property in order to grow them, and they have a good return on investment," says husband James Finlay, who like many others worked several years in North Dakota's oil fields when the economy turned sour in 2008. With Luke Miller Callahan's The Complete Guide to Growing and Selling Microgreens as a guide, the couple converted a portion of their Hayden-area garage with lights, shelves, reflective material (to trap heat and focus the light), and a small heater. They fill trays one-inch deep with the best soil they can find — they like FoxFarm dirt with built-in fertilizer — and compost the spent soil after harvesting. The Finlays use non-GMO seeds to grow such varieties as pea shoots, sunflower, broccoli, kale, daikon and rambo radish. They call their operation Fortis Farm, and have plans to add ducks (for both meat and eggs), as well as more crops in the near future. James Finlay readies microgreens for sale. Finlay and his wife Mary grow and harvest the greens year-round at their Hayden-area home. "The more we learn about where our food comes from and where it is grown," says James, "the more we want to grow our own, and it turned into 'How can we pay for what we eat?'" Selling to local restaurants is a win-win, and the Finlays have found a willing supporter in Chris Detar, head chef at The Cellar in Coeur d'Alene. "All the micros are used with flavor as the primary focus, and the beauty comes naturally," says Detar, who purchases sunflower and pea shoots, as well as broccoli, kale and chard, which he likes to pair with pork or lamb. "Radishes," he says, "have a very peppery bite and pair very well with steaks and rich meat dishes, almost like a touch of horseradish." The potential for microgreen varieties is virtually limitless. Any edible green is fair game: cabbage, carrots, beets, mustard, watercress, arugula, celery, clover, flax, kohlrabi, garlic chives, spring onions, even cilantro and dill. In addition, microgreens are less risky to grow than sprouting seeds in a jar, a method linked to a range of serious bacterial outbreaks such as salmonella. They can be grown hydroponically or even aeroponically. 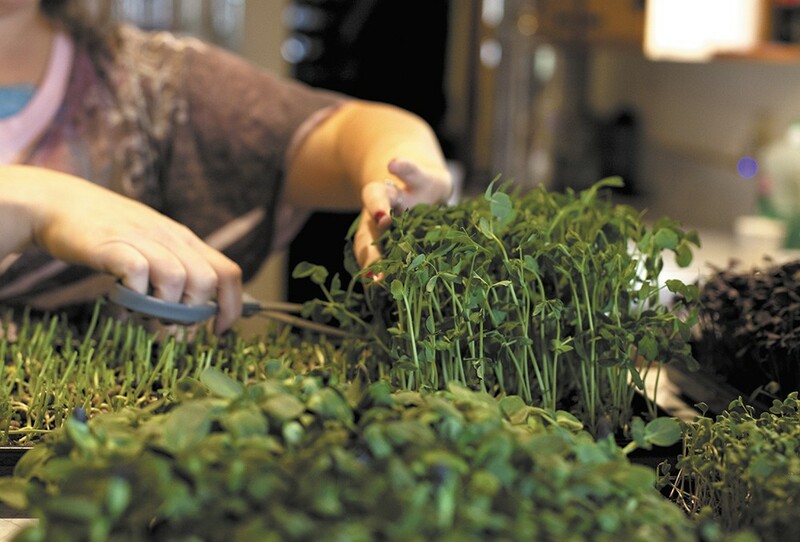 Harvesting microgreens is as easy as using a pair of scissors to trim the plants just above the soil line. The Finlays then package the greens in 2- to 4-ounce compostable containers and deliver them to customers. Micro-greens are part of an excellent salad. The Cellar's Chris Detar often takes a less-is-more approach to microgreens, just adding a little oil and salt so the natural flavor of the greens shines through. But the tiny leaves are also delicious paired up with "macro" greens. In this salad, perfect for accompanying a hearty holiday meal, the bright citrus dressing complements tart Granny Smith apples, peppery arugula and a distinctive medley of microgreens. 1. Zest and juice all citrus. 2. Combine all dressing ingredients except oil in a blender. 3. Slowly drizzle oil into blended ingredients, keeping blender on low speed to emulsify. 4. Toss apples with greens and chèvre. 5. Dress greens to taste, seasoning with more salt and pepper if desired.